Need a few suggestions for day hikes? Explore the Uwharrie Lakes Region in central NC with these day hikes recommended by the Haphazard Hikers. 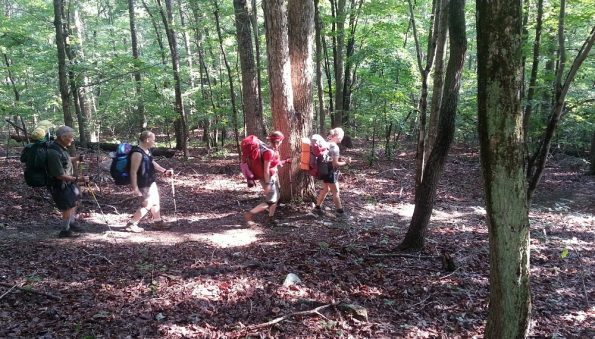 Despite their name, this group of young-at-heart ladies from the Charlotte area knows a bit about day hikes. They hike in the Carolinas on a regular basis and have been for many years. 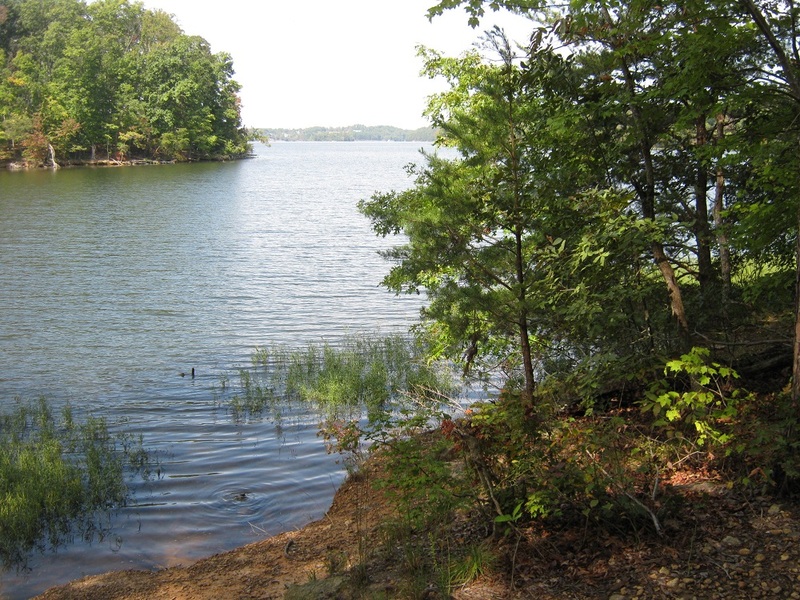 The Uwharrie Lakes Region is one of their frequent hiking destinations. I recently asked one of their leaders, Jill, to share a handful of their favorite day hikes. While the Haphazard Hikers like to hit the trail, they also like to have time for a relaxing local lunch afterward and still get home at a decent hour. If you're looking for a decent walk but are willing to take time to enjoy the scenery and the company of good friends, these day hikes are perfect for you! This section of the Uwharrie Trail is relatively new. It was reopened in 2013 with the dedication of the Joe Moffitt Trailhead. Joe Moffitt was the Boy Scout leader largely responsible for creating the Uwharrie Trail in the 1970's. This part of the trail crossed private land at that time and was closed to the public during the 'naughties' decades ('nineties' plus 'aughties'). Work by the Land Trust of Central NC and many others helped purchase the property and put it into public ownership, allowing the trail to be reopened. From the trailhead, this out-and-back route heads south and gently climbs to the top of Little Long Mountain, once called Bald Mountain, in about 3/4 of a mile. There is an AT-style camping shelter at the top, built by Boy Scouts. 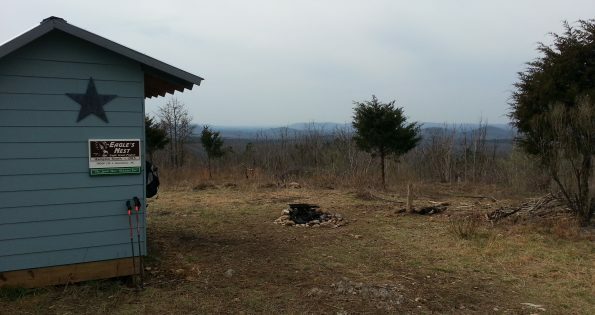 The Eagles' Nest shelter is the only one along the Uwharrie Trail. 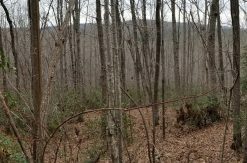 There are nearly-360-degree views of the surrounding area from the top, also the only place along the Uwharrie Trail with such a vista. The route then descends to Poison Fork ('fork' is one of the dozens of recognized terms for a flowing body of water) and follows it for about half a mile before crossing to the other side. The route then climbs over a low ridge and crosses the paved Flint Hill Road at Barnes Creek. Turn around at the Jumping Off Rock Trailhead on the far side of the road bridge. The total hike length will be about 6 miles. If you're feeling energetic, follow the paved road beyond the trailhead for another quarter mile and visit Jumping Off Rock. This small, undeveloped scenic overlook is on the left side of the road. Just don't jump off - the water at the bottom is pretty shallow! 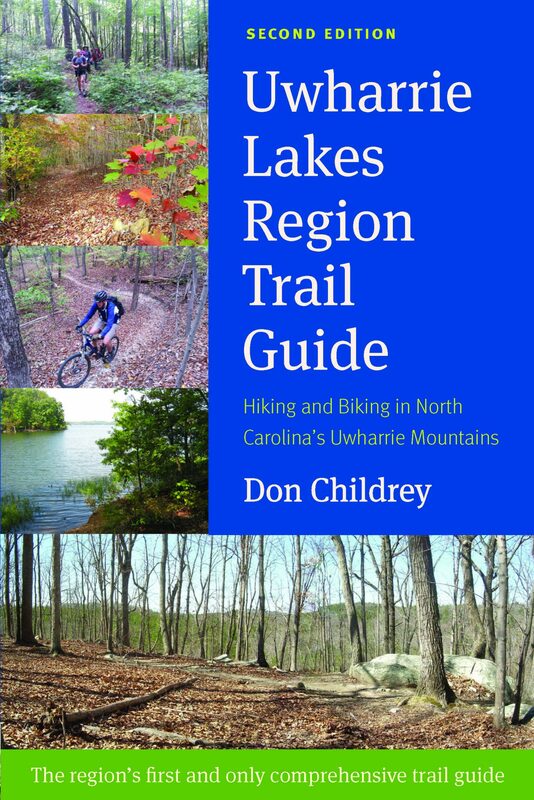 A map and profile for this day hike route are found on pages 432 and 433 in the Uwharrie Lakes Region Trail Guide, (also available on Amazon.com). This out-and-back route follows the Uwharrie Trail from the Jumping off Rock Trailhead southward. The turnaround point at Panther Branch Road is just over three miles from the start, but this isn't necessarily an easy hike. Within the first mile, the route gains over 400 feet in elevation as it climbs over Dark Mountain. As you're picking your way up this rocky climb, consider what it might be like to run back down it after running 39 miles of trail. That's what the ultra-runners in the Uwharrie Mountain Run 40-miler do each spring! After passing over Dark Mountain, the route crosses Dusty Level Road, a gravel public road, before curving around Horse Mountain. The route then drops fairly steeply before reaching Panther Branch Road, a gravel Forest Service road closed to traffic. The Haphazard Hikers usually turn around here, giving them a roundtrip distance of just over 6 miles. If you follow the trail another quarter mile downhill you will find Panther Branch itself. The area around this stream crossing is a popular campsite and can serve as a relaxing spot for a break or lunch stop. Turning around here makes for a roundtrip distance of about six and a half miles. 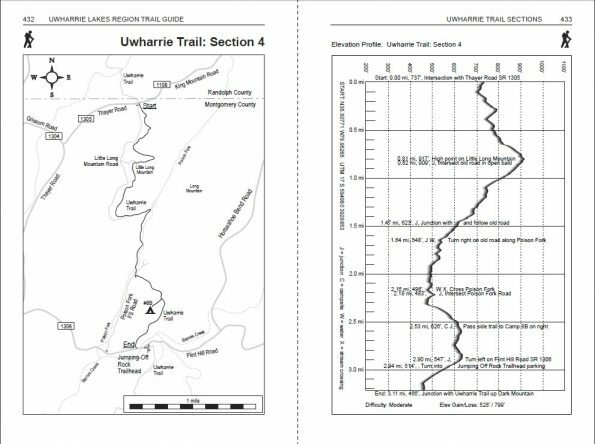 Find more details, including elevation profiles and maps of this day hike route on pages 434 and 436 in the Uwharrie Lakes Region Trail Guide, (also available on Amazon.com). This day hike route consists of two separate loop trails that both start in the Boat Ramp Parking Area in Morrow Mountain State Park. The parking area itself is fairly scenic, with picnic tables and a dock along Lake Tillery, and can be a nice break spot between or after your hikes. Fall Mountain Trail is best hiked counterclockwise. Follow the trail along the lakeshore to the Narrows Dam. The trail then turns away from the lake and climbs over Fall Mountain, gaining nearly 500 feet of elevation in the first two miles. The trail then drops down the other side of the mountain and circles around to end back at the boat ramp for a total of just over four miles. The Three Rivers Trail starts from the same parking area. 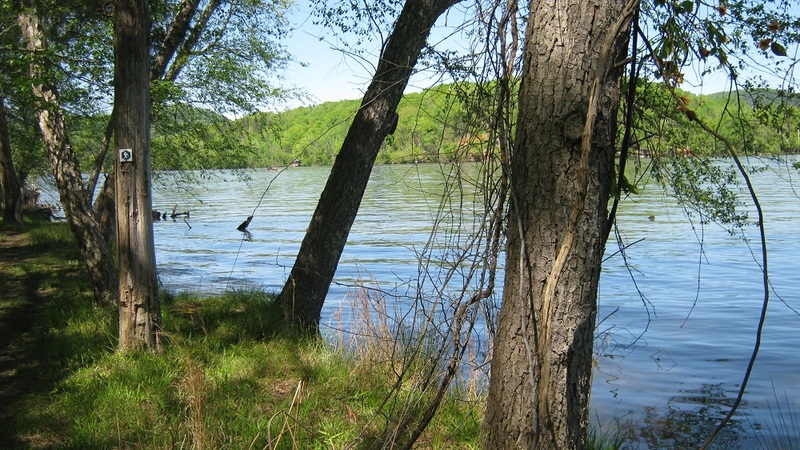 This 3/4 mile long trail stays low and close to the lake, where it overlooks the confluence of the Yadkin and Uwharrie Rivers. The Pee Dee River begins at this confluence, hence the trail's name - Three Rivers. This trail is a nature trail with interpretive stations along the way. Brochures available at the Ranger's office describe what you can see at each station. Together both trails total 4.75 miles, with more than 850 feet of elevation gain. Find more details, including elevation profiles and maps of this hike on pages 348 and 368 in the Uwharrie Lakes Region Trail Guide, (also available on Amazon.com). This out-and-back day hike starts at the NC 24/27 Trailhead, which is the southern end of the Uwharrie Trail. Follow the Uwharrie Trail northward for about 3 miles and then return. The highest and lowest points along this hike are within 200 feet elevation of each other, but you do get to enjoy a number of ups and downs within that range. The first mile or so of the Uwharrie Trail follows downstream along Wood Run. 'Run' is yet another name for a flowing body of water. The route eventually crosses Wood Run and then crosses one of its tributaries soon after. The route then climbs to intersect the Keyauwee MTB Trail at about 2 miles. It then descends to cross Upper Wood Run and follows it downstream. Turn around when the trail leaves the creek and starts to climb again. Total distance for this hike is just over six miles. Find more details, including elevation profiles and maps of this hike on pages 446 and 444 in the Uwharrie Lakes Region Trail Guide, (also available on Amazon.com). 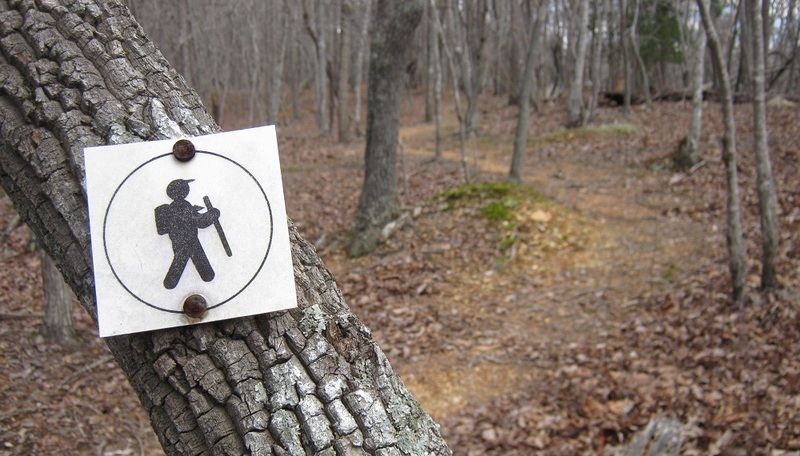 This out-and-back day hike starts at the NC 109 Trailhead, north of Troy, NC. In late spring, the abundant mountain laurel along this section is in bloom. This trail rolls gently along a ridge as it descends about 250 feet in elevation until reaching the wooden bridge over Spencer Creek at just over two miles in. 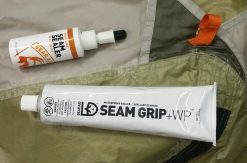 The camp areas near Spencer Creek are a nice place to stop for a break. The trail then climbs, passing Camp Road, which leads to the West Morris Mountain Hunt Camp. At the top of this steep hill, the trail crosses Morris Mountain Road, an old dirt road, at about two and a half miles into your hike. The next road crossing is the gravel Barnes Creek Overlook Road, another Forest Service road closed to traffic, which is one and a quarter miles beyond Morris Mountain Road. Depending on how much energy and time you have, you can turn around at Spencer Creek, Barnes Creek Overlook Road, or somewhere in between. You'll end up with a total hike distance somewhere between 4 and 7.5 miles. Find more details, including elevation profiles and maps of this hike on pages 438 and 436 in the Uwharrie Lakes Region Trail Guide, (also available on Amazon.com). If you prefer walking along a lake over climbing long hills, hike the Badin Lake Trail. This five and a half mile loop follows the shoreline of Badin Lake around the long peninsula where the Forest Service campgrounds are located. The normal trailhead for this route is the Cove Boat Ramp parking area, but you can also hop on it from the King's Mountain Point day use parking area or from one of the campgrounds if you're camping there. The trail crosses several gravel Forest Service roads and a couple equestrian trails along the way. You will gain a total of about 650 feet of elevation as the trail works its way along the uneven shoreline and eventually crosses back over the peninsula, but the highest point is less than 150 feet above the lake. Find more details, including elevation profiles and maps of this hike on page 56 in the Uwharrie Lakes Region Trail Guide, (also available on Amazon.com). All of these day hikes are less than two hours' drive away from the ten million people living in the Triangle, Triad, and Charlotte areas of North Carolina, but you'll be lucky to see a handful of other hikers on these trails. 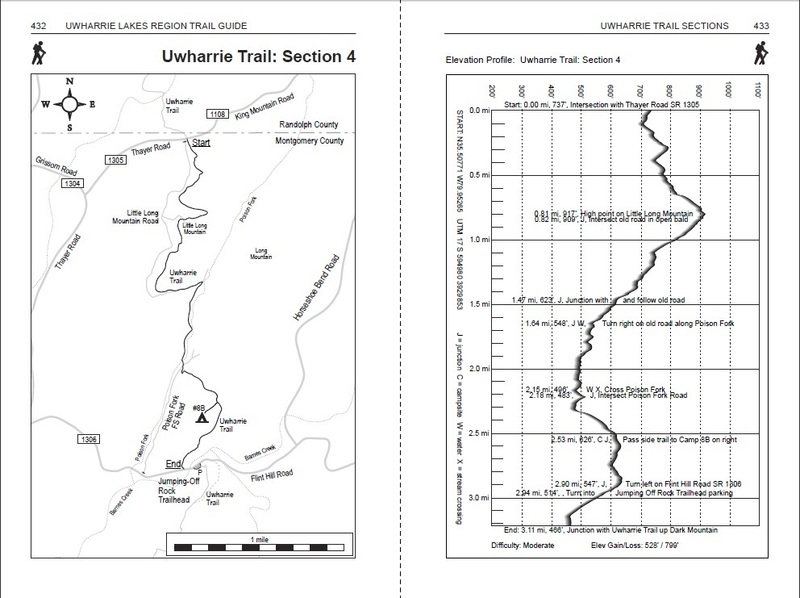 Trailhead locations, maps, elevation profiles, and many more details for these hikes and the other 215+ miles of trail in the Uwharrie Lakes Region can be found in the Uwharrie Lake Region Trail Guide, available through donchildrey.com or Amazon.com. Explore different map layers for these areas using the CalTopo website.